Luxurious hotel is a part of Sani Resort complex. 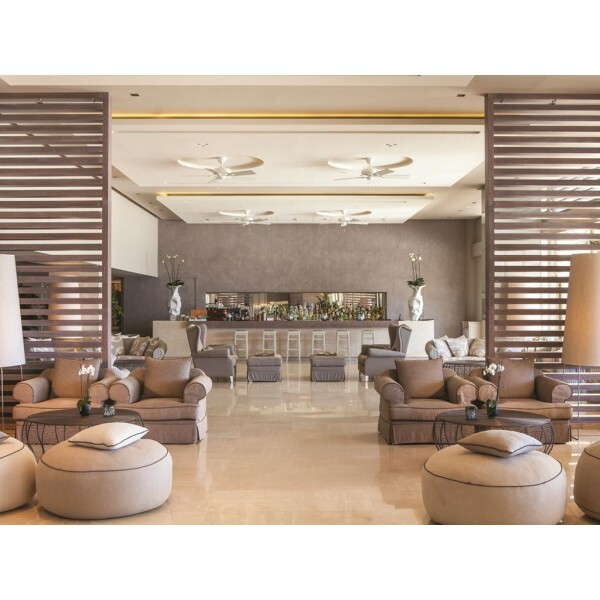 The hotel offers breathtaking views of Mount Olympus, beautiful private sandy beach – marked with EU “Blue Flag”, a luxurious spa, comfortable rooms and suites, restaurants and bars, shops, creches, children’s mini club, teens club, sports facilities, cinema, entertainment. Luxurious hotel is a part of Sani Resort complex. The hotel offers breathtaking views of Mount Olympus, beautiful private sandy beach – marked with EU “Blue Flag”, a luxurious spa, comfortable rooms and suites, restaurants and bars, shops, creches, children’s mini club, teens club, sports facilities, cinema, entertainment. The complex offers an active Orthodox Church. The hotel is located on a beautiful cape. 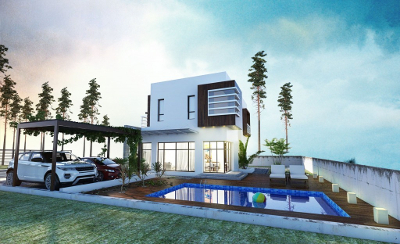 It is offered a comfortable accommodation and a wide choice of entertainments to fit every taste. It is recommended for exclusive family holidays. The hotel consists of 2 eight-storey building. Last hotel renovation took place in the winter of 2014. In 2012, Sani Resort has been awarded by Russian Conde Nast Traveler as “Best Foreign family-run Hotel”. 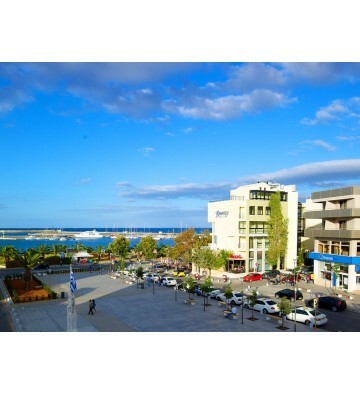 The hotel is located within 45- minute driving distance, 8 minutes by helicopter from Thessaoniki. Gold card repeaters receive a complimentary bottle of regional wine upon arrival. 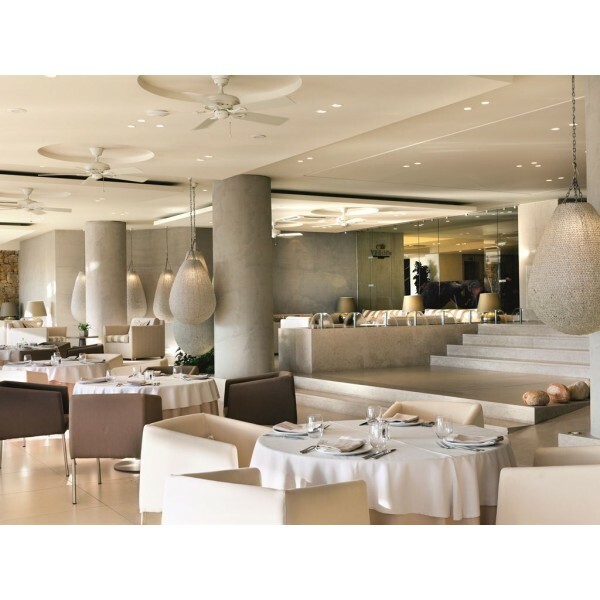 They also benefit from an exclusive 10% off in most Sani Resort restaurants and bars as well as most bars, restaurants and shops at Sani Marina. Just make sure you carry your gold membership card which you will receive at check-in. Platinum Card repeater benefits (for guests who have visited Sani more than ten times or have spent more than 100 overnights with us). One complimentary dinner for two adults in one of Sani Resort’s restaurants accompanied by a bottle of “Land of Grace” red or white wine, exclusively produced for Sani under the special care of the renowned oenologist Evangelos Gerovassiliou. This exclusive benefit is available to platinum members once per season. 6 conference halls (with the capacity 20-600 seats, a press room, business center). Shops - mini-market, jewellery shop, beauty boutique. My Spa offers an outdoor heating pool with Jakuzzi, a gym, a sauna and a hammam - free; a hairdresser, manicure, massage - at a charge. 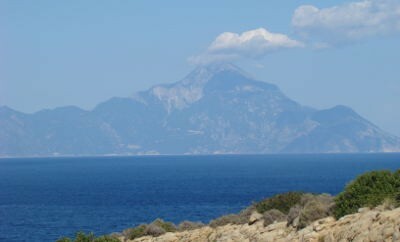 Wellness treatments, seaweed masks, reflexology, aromatherapy with unique Greek natural ingredients (pure essential oils, plant extracts) are offered. Spa center services can be used by adults over 16 years. Wellness treatments at My Spa- SPA center - a source of positive energy at an affordable price. This is the place where nature inspires feelings. Diet of ancient Greeks was based on plant properties – extensive use of fruits, vegetables, grapes, olives and wheat. This way of dieting is known as Mediterranean diet. Unique Greek natural ingredients, pure essential oils, nutrients and herbal extracts are all included in the procedures carried out on the basis of high-end cosmetics of French brand Anne Semonin Paris and Greek Apivita. Salon professionals guarantee an excellent result, effective care and skin radiance. 9 luxurious treatment rooms with all modern amenities. 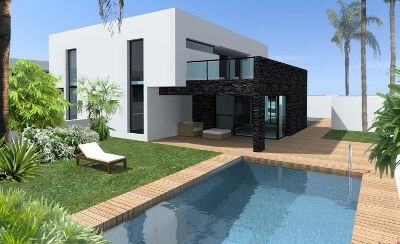 Heated indoor pool with Jacuzzi and panoramic windows with magnificent views of garden and the Aegean Sea. Gym with modern cardio equipment with garden view. Thermal suite with a Turkish bath (hammam), caldarium, sauna and bio sauna. Apivita and Anne Semonin cosmetic boutique. Energy drainage massage with lymphatic drainage uses essential oils that reduce swelling and cleanses the skin. Aromatherapy facial drainage and soothing scalp massage. Soothing aromatherapy scalp massage combined with facial massage with Anne Semonin draining effect. Relaxes, soothes and heals. Express "Awaken" facial refreshing cryo - therapy designed for quick results. Facial cleansing and detoxifying clay. This facial treatment is designed for skin that needs deep cleaning. Moisturizing facial treatment ideal after sunburn. This procedure uses cucumber extract which strengthens the protective properties of skin; it deeply moisturizes and restores skin balance. Magic around the eye skin care; this procedure uses ice cubes offering express glow, combined with a therapeutic lymphatic eye massage. “Exclusively Made Facial Treatments” Based on consultation with the beautician, taking into account the characteristics of everyone’s skin individually and creating a blend of essential oils, active elements, serums and oils. Mediterranean nourishing facial treatment. This procedure is based on the antioxidant constituents and nutrients. 'Sun Glow' facial treatments with white kaolin clay. Mild treatment after sunbathing moisturizes and soothes dry, irritated and sun damage skin. Royal facial treatment with Royal jelly and honey. “Royal care" based on the properties of royal jelly and honey restores and tightens the skin. Facial care removing toxins (with red grapes and algae). Ideal for combined skin. The procedure cleans the skin with lymphatic drainage massage and traditional techniques. Luxurious anti-aging eye and face care Anne Semonin. This facial and around the eyes skin treatment is specially designed for mature, dry or dull skin. Cleansing Facial Treatment (with St. John's wort) This express facial aromatherapy brings instant results: skin looks fresher. Invigorating facial treatments for men specifically created for the needs of modern man. Balancing facial treatment, shoulder and scalp (for men) The procedure begins with back and neck massage, which relieves muscle tension, and is combined with facial treatment. Relaxing scalp and shoulders – relaxes and relieves stress. Express exfoliation with black sand: unique exfoliation with black sand from Tahiti and aromatic oils helps to remove dead skin cells. The skin becomes wonderfully soft and silky and detoxified. Refreshing Foot Care Revitalizing and refreshing massage for tired feet. Cream with arnica and ruscus restores microcirculation. Body scrub with olive pits. Scrub with olive pits - perfect recovery procedure, the skin is well-groomed, becoming soft and hydrated. Anti-stress back mask with self-heating mineral mud and foot massage. The method is specially designed to relieve tension and relax the muscles. Exfoliating body care “Sun Glow”: body wrap with yogurt and kaolin, sweet almond oil and extracts of tangerine. This moisturizing and nourishing skin care is designed for dry, dehydrated and sun-damaged skin. Detoxifying body wrap with algae spirulina, rosemary and ginger extracts. Body wrap with algae Spirulina removes toxins, reduces weight and recharges your batteries. Lipo -lysis and cellulite care (With red and black pepper).This procedure with red and black pepper helps to effectively prevents cellulite and reduces fat. Body Care "Queen Bee" with milk and honey bee. "Queen Bee" procedures use unique properties of royal jelly and honey. My Spa Aromatherapy Massage Relax massage (individually made for each type of skin) using warm oil, sweet almond plants and aromatherapy. Relaxing neck and back aromatherapy massage Express massage using warmed aromatic oils focuses on back, neck and shoulders and relieves stress and healing the body. "Deep tissue" Massage deep and strong massage with pressure on particular muscles and connective tissue. Massage with a combination of shiatsu and Thai massage unique promptness ancient Thai and Japanese techniques, created exclusively for My Spa guests. Free circulation of energy in the body is restored by stretching, squeezing and pressing specific points (acupuncture). Relaxing bath with ocean oil. Energizing bath with hot oil. Moisturizing hand care scrub with salt, sweet almond oil and lavender extract. Caring, softening skin, includes luxurious bath with salts of the southern seas and gentle exfoliating mask with warmed aromatherapy oils and sea salts. Energizing Foot Care scrub with salt, sweet almond oil and basil extract. Nourishing foot care includes mitigation active oil and nourishing hot peeling mask with warmed aromatherapy oils and sea salt. After this procedure feet look more groomed. Use of indoor spa pool, hammam, sauna, and gym are free for hotel guests. Use of spa, gym and sauna allowed guests aged over 16. Younger guests (aged under 16) may use the pool from April to October from 08:00 - 14:00. In case of cancellation, please notify 24 hours prior to appointment (to avoid full payment). Delay to the session implies service is available only for the remaining time. The hotel offers electric cars for their guests. Super comfortable beach towels (size 1 * 2.16) - free of charge. Kiosks with beach towels are opened all day. 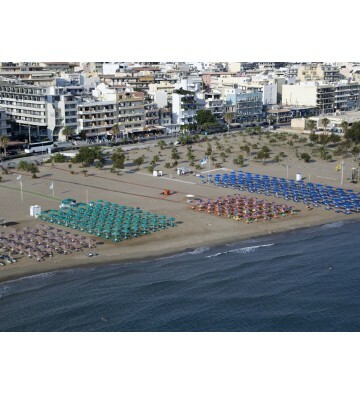 2 private sandy beaches are being awarded by Blue Flag every year. One of them is located in front of the main buiding under the palms. There are a water sports center and a chilren's water slides at the foot of Cape Sani. The main beach Bousoulas is the best beach of the resort with more than 5 km of sands. Here you will find a beach rest for every taste: secluded sun loungers; sun loungers next to the most fashionable beach bar of Chalkidiki - Bousoulas, where the music is performed by famous DJ and beach parties are held. At a charge. Tennis club with professional instructors. All courts are with lighting and Canada Tenn surface. There are ramps; there aren't any special rooms. 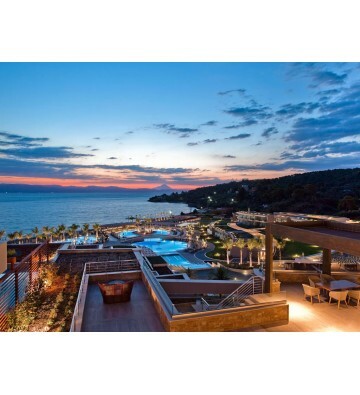 Located on Kassandra peninsula, within Sani Resort territory, 80km from “Macedonia” International Airport, Thessaloniki city; within 45- minute driving distance and 8 minutes by helicopter. The hotel consists of an eight-storey building (2 bodies). Last hotel renovation took place in the winter of 2013. In 2012, Sani Resort was awarded by Russian Conde Nast Traveler as “Best Foreign family-run Hotel”. A total of 394 rooms : Double Rooms Sea View / Garden View, Triple Rooms Sea View / Garden View, Family Rooms Sea View / Garden View, Junior Suites Sea View / Garden View, Junior Suites Sea Front, Panorama Junior Suites, One Bedroom Family Suites, Two Bedroom Family Suites, New! Two Bedroom Family Suites Beach Front, New! One Bedroom Family Suites Beach Front. Room Amenities: balcony / terrace, floor- to-ceiling windows, bathroom (shower rain shower or bathtub), hair dryer, bathrobe, slippers, exclusive toiletries from French perfume house Pascal Morabito; double beds. Queen-size bed or 2 single beds, mattresses ultra comfort - Dream Bed, exclusive linens, duvets, additional pillows ( only available at Junior Suite & Suite categories); plasma TV, satellite TV (music channels), CD / DVD- player,free Wi-Fi internet access, direct dial telephone, air conditioning individual temperature control, electric safe (free ), mini - bar, tea and coffee facilities, Nespresso coffee machine in Junior Suites & Suites. All Junior Suites & Suites provide exclusive Anne Semonin toiletries. On the arrival date guests are welcomed with a bottle of Greek wine and bottle of water, in the room. Double Room for Single use (~ 25 m) garden or sea view; accommodates up to - 1 adult or 1 adult and 2 children maximum, limited number of this type of rooms. Double Room (~ 25 m) garden or the sea view; accommodates up to 2 adults. Triple Room Garden / Sea view (~ 25 m) accommodates up to 2 adults and 1 child (0-12 years); king size bed (Queen) and sofa bed. Family Room (~ 50 m) garden or sea view; 2 double rooms with connecting door; accommodates up to - 2 adults and 2 children , 3 adults and 1 child or 4 adults. Junior Suite Garden View (~ 35 m) is located in "B" building on the 1st, 2nd and 3rd floors; fully renovated in 2010-2011; open plan living room and bedroom, garden and swimming pool; accommodates up to 2 adults and 2 children. Junior Suite Sea View (~ 35 m) located in "B" building; fully renovated in 2010-2011; open plan living room and bedroom, sea view; accommodates up to 2 adults and 2 children. Junior Suite Sea Front (~ 35 m) located in "B" building on the 1st floor; fully renovated in 2010; terrace and private garden with table and 2 chairs and 2 sun loungers, direct access to the beach; accommodates up to 2 adults and 2 children. 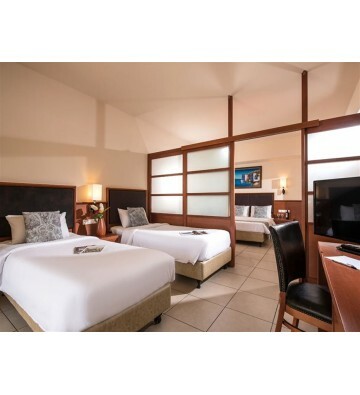 Panorama Junior Suite (~ 40 m) new spacious rooms with sea view located in "B" building; open plan living room and bedroom, balcony with table and two chairs; accommodates up to 3 adults and 1 child or 2 adults and 2 children. 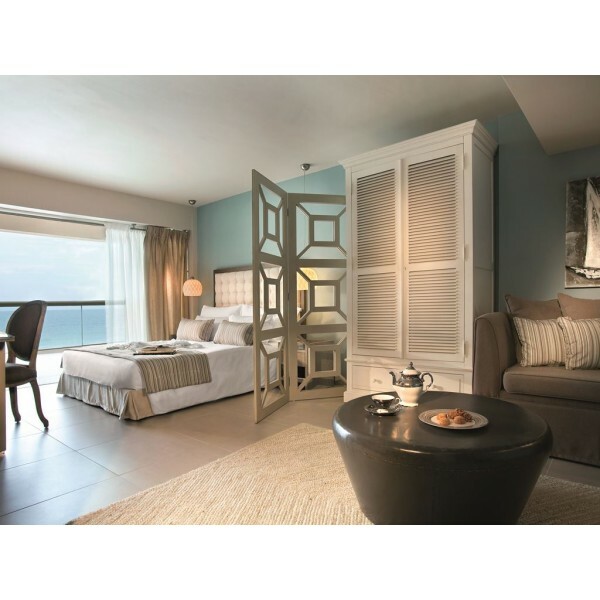 One Bedroom Family Suite (~ 50 m) renovated in 2011 – 2012; consist of an elegant living room and separate bedrooms, majority of rooms are located in "B" buildings with sea or pool or Sani bay view; accommodates up to 2 adults and 3 children, 3 adults and 2 children. Two Bedrooms Family Suite (~ 70 m) marital suite; consist of an elegant living room , 2 separate bedrooms, 2 bathrooms (one - with bath and shower, second - with shower); located in " B" building with sea view; accommodates up to 3 adults and 2 children, 4 adults and 1 child, or 2 adults and 3 children. New! Two Bedroom Family Suite Beach Front (~ 105 m) spacious suite with the highest level of luxury; direct access to the beach - Sani Hill; 2 large bedrooms, separate living room and two bathrooms; both bathrooms provide Anne Semonin toiletries; modern design, floor- to-ceiling windows, private garden and terrace, deck chairs, rattan table and chairs; accommodates up to 4 adults and 1 child, or 2 adults and 3 children (aged under 12). New! One Bedroom Family Suites Beach Front (~ 70 m) spacious suite with the highest level of luxury, direct access to the beach - Sani Hill; separate bedroom and living room; modern design, floor- to-ceiling windows, stunning views, private garden and terrace with rattan furniture; Anne Semonin. Toiletries; accommodates up to 3 adults and 2 children or 2 adults and 3 children (aged under 12).